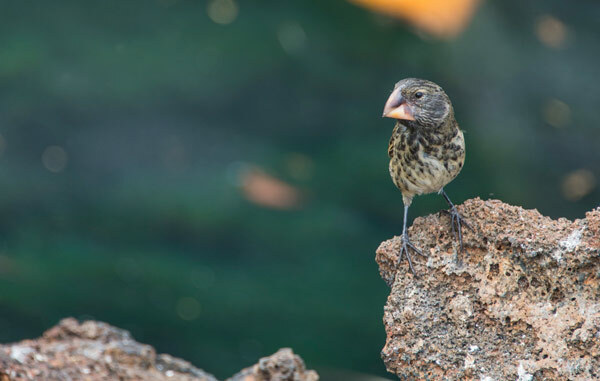 There are 13 different species of finches found on the different islands in the archipelago, and naturalists believe they all descended from a common ancestor that somehow found its way to the islands ages ago. Some look so similar that it takes a trained eye to tell them apart while others look so different it is difficult to believe they are the same species. 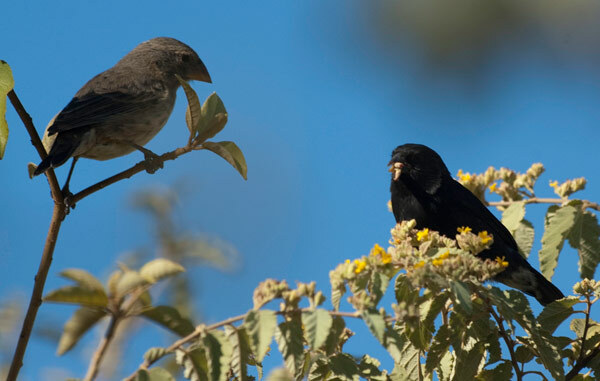 Generally, Galapagos finches are small birds with small pointy beaks who flit around in low shrubs and on the ground. 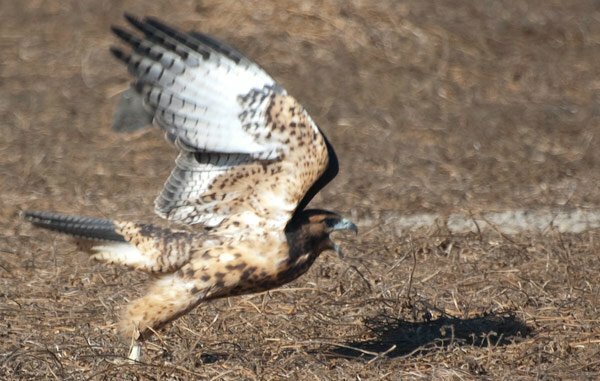 It is their evolutionary paths that makes them so interesting: some eat seeds, some insects, some feed on the ground, some on shrubs. They have evolved to perfectly fit with their environment and not compete with one another. The Galapagos finches will forever be associated with Charles Darwin, the great nineteenth-century naturalist who used them to illustrate his Theory of Evolution. 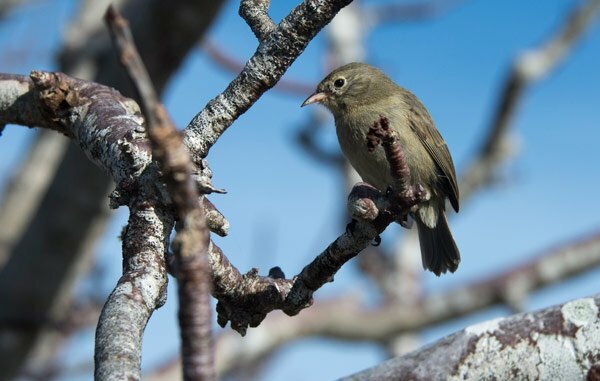 Ages ago, a single finch species made its way to the Galapagos. Today, there are thirteen different species of finch spread out over the islands, each of which has adapted to its specific environment. Your naturalist guide will be happy to point them out to you and explain the adaptations made by each sort of finch over the years! 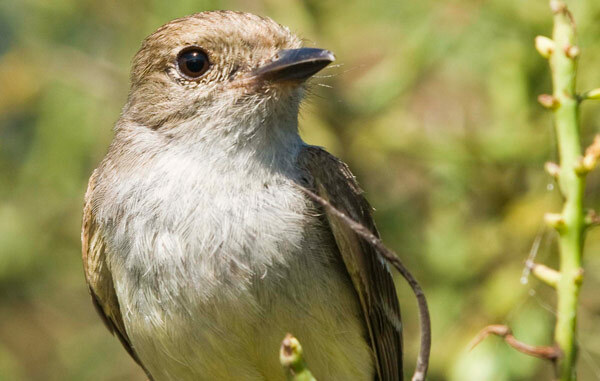 Interesting fact: Long ago a single finch species made its way to the Galapagos. Today, there are thirteen different species spread out over the islands. 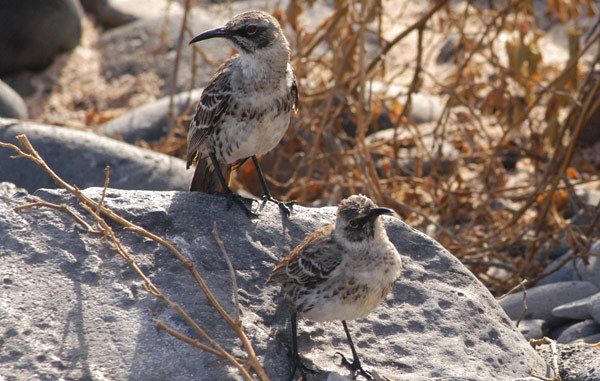 Although his name will forever be associated with the finches, initially Darwin was much more interested in the mockingbirds that he found on the islands. 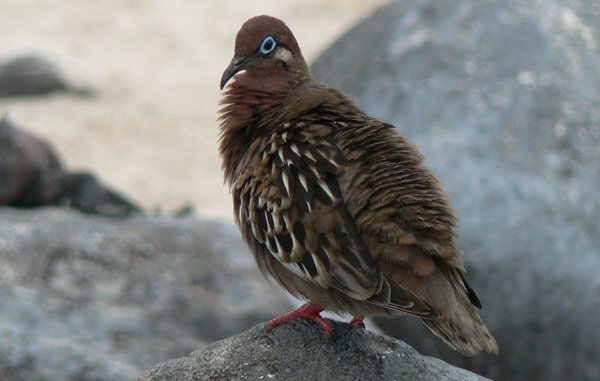 These clever birds are larger than the finches and have a salt-and-pepper coloration. 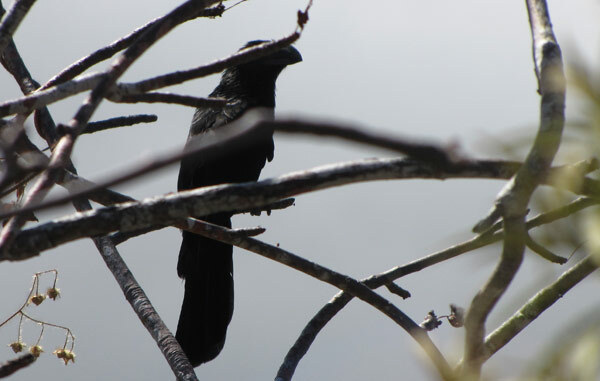 On some islands, they have curved beaks, on others, their beaks are straight. 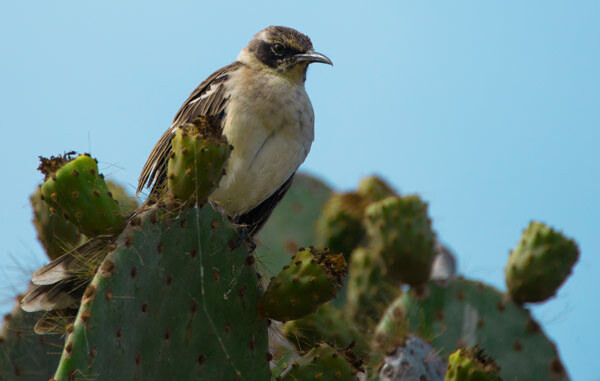 There are four different species of mockingbird in the islands. They continue to evolve: the Española mockingbird has learned to ask tourists for water: it is the only one to do so (don't give them any, by the way). The mockingbirds have an interesting social structure: they band together in groups of up to 40 birds and stake out a "territory," chasing away other birds who encroach on their turf. 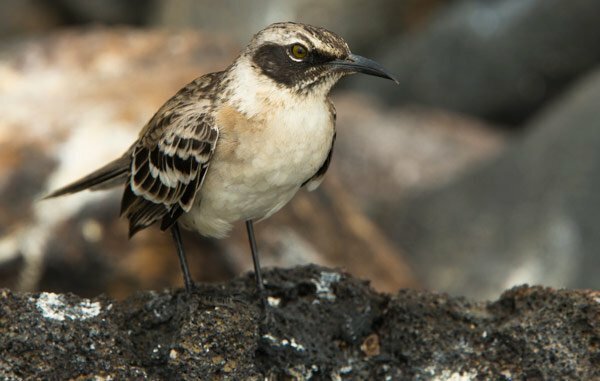 Interesting fact: The Floreana Mockingbird have been extinct on the island for decades. Now they only survive on two islets (Champion and Gardner) off the coast of Floreana. 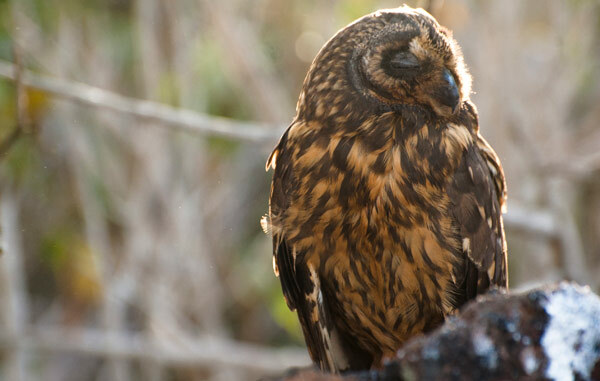 The short-eared owl doesn't actually have "ears" like mammals do, but rather tufts of feathers that resemble ears and gave them their name. The best place to see them is on Genovesa island, although they can be found everywhere. 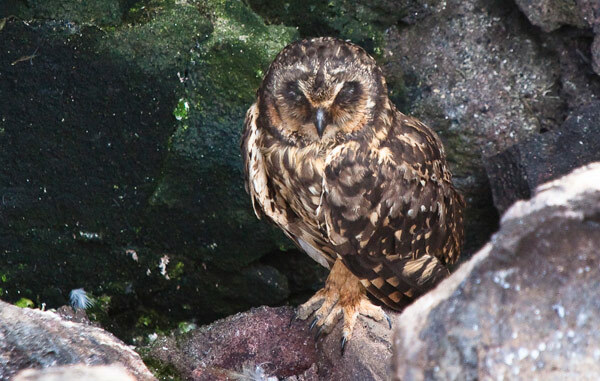 Unlike most owls, they hunt during the day, usually in the morning and evening. They feed on small mammals like rats and mice as well as small birds and reptiles. 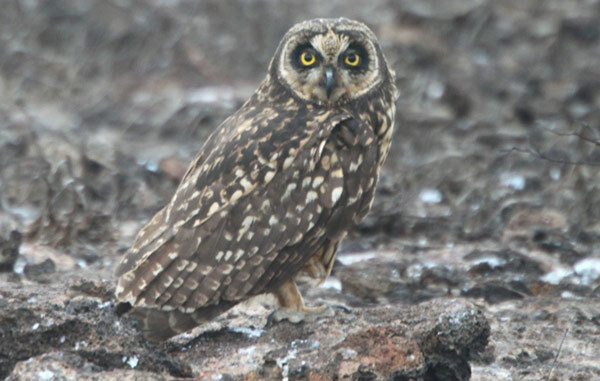 Where is it found: The Galapagos short-eared owl is wide-spread throughout the Archipelago. 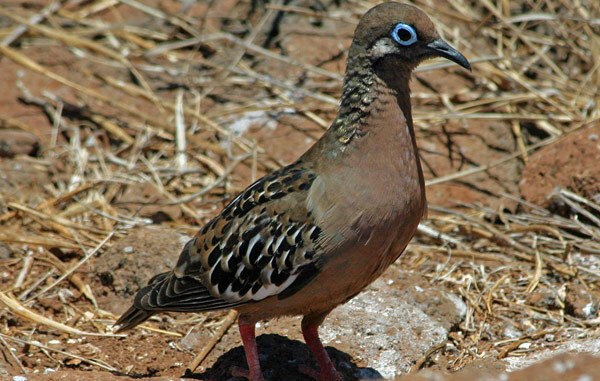 They are most frequently seen hunting in Genovesa. 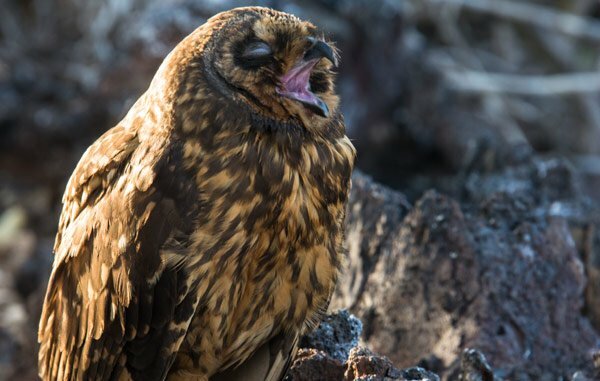 Interesting fact: They are most active at night and early in the morning and can be seen in the day time on islands where the Galapagos hawk is absent. 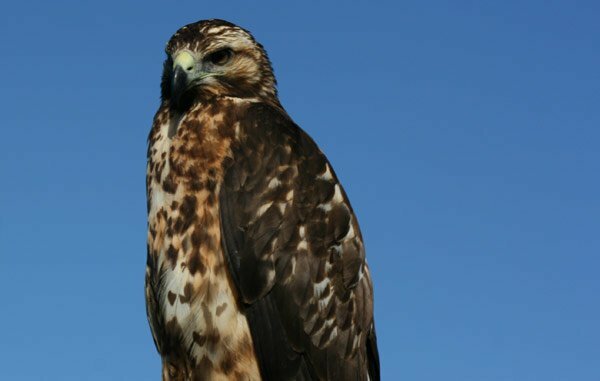 Until the arrival of humans, the Galapagos hawk enjoyed the status of top predator on the islands: they had no natural predators until humans introduced cats, dogs and other animals. 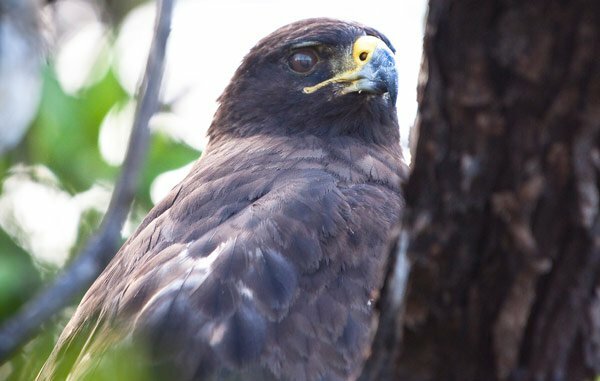 This endemic hawk feeds on rats, mice, reptiles and smaller birds. They are tough, swift and strong, and capable of taking out a medium-sized iguana if they are hungry enough. They also feed on small Galapagos tortoises, although these days most small tortoises are raised in captivity. They have been known to eat carrion as well, such as dead goats. They are found on every island. Where is it found: On most islands in the archipelago, except Baltra, Daphne, Floreana, San Cristobal, and Seymour. 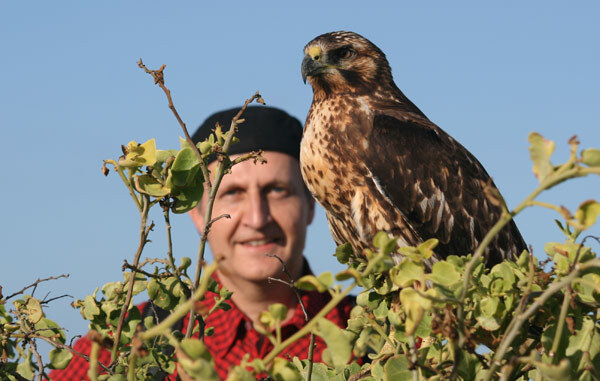 Interesting fact: They usually hunt in groups of 2 or 3, soaring at heights of 50 to 200 meters in the sky. 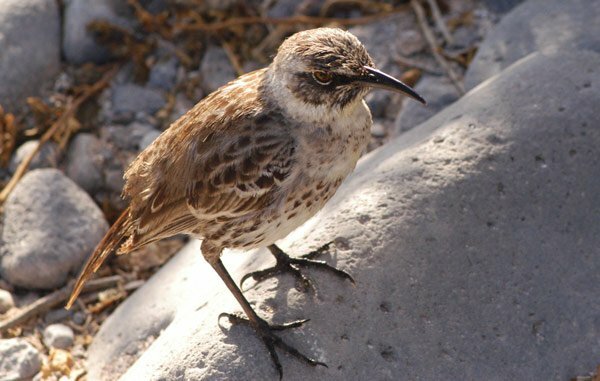 This attractive bird can often be seen scurrying along the ground in brushy, rocky areas. 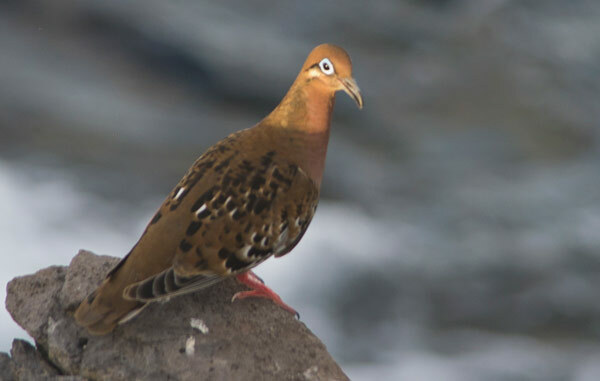 They have reddish-brown plumage and striking blue circles around their eyes. They eat seeds and insects and tend to be very shy, although if you move slowly enough you can usually get a good look. They tend to prefer dry areas to wet highlands. Where is it found: Can be found at the arid lowlands of the archipelago. 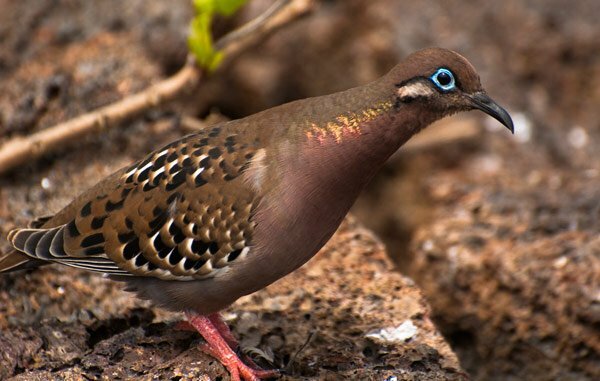 Interesting fact: The long downward curved beaks on the Galapagos Dove helps it feed mostly on seeds and fruits from the ground. 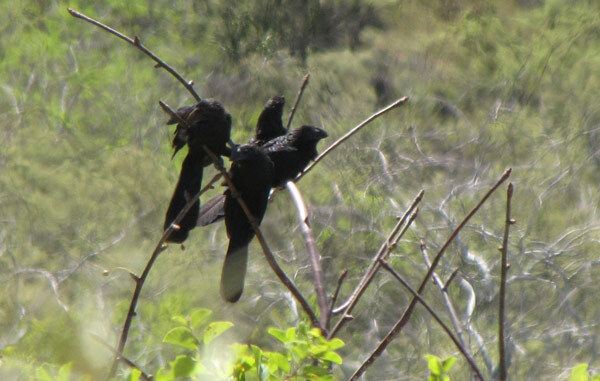 Not native to the Galapagos, the smooth-billed ani arrived within the last 50 years. 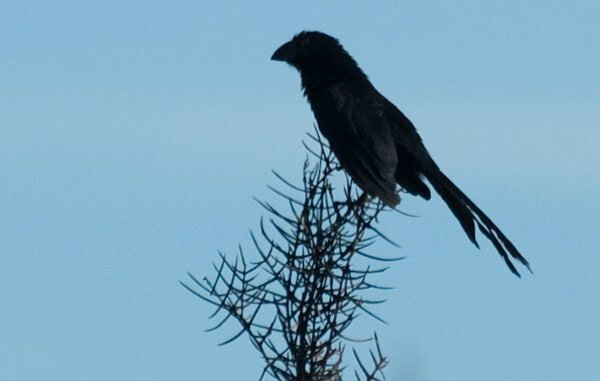 It's a largish, black bird: if you get a quick look at one, you may mistake it for a crow. Like other introduced species, there is an effort underway to eradicate it. It eats insects and small reptiles. Where is it found: Isabela, Santiago and Santa Cruz Islands. 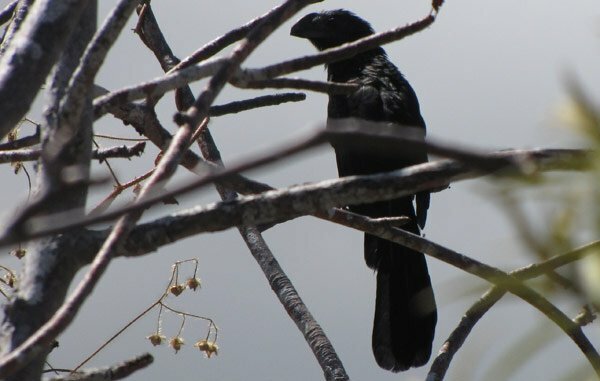 Interesting fact: The Smooth-billed Ani was introduced to the Galapagos archipelago in the 1960s, since when its population has grown significantly.